Hi, I'm Jay, and today we are going to diagnose why there's not water running down the drain on this Aprilaire humidifier, even though it's turned on. First thing we want to do, is find out if we have water pressure here. So, first thing we want to do for that is turn the water off. Be sure to turn the power off before performing any maintenance. Before performing this service, it is necessary to shut off the water. Find the saddle valve, turn it clockwise, until it stops. Alright, now that the power is turned off and the water is turned off, we're going to disconnect this line right here, which is the incoming water to the solenoid valve. We'll find out if we have water pressure here. So we got our wrenches, 1/2 inch and 7/16. Ok, now let's point this in the bucket, and get the water turned on. Alright, let's have our assistant turn the water on. Alright, that's good. Let's turn the water off. Ok, now, we have proven that we have water pressure at this point. So, that means everything up to this point is ok. So the problem is the solenoid valve, or the orifice or something else going wrong. Now, if we did not have water here at this point, when our assistant turned the water on, the problem is upstream. Probably that valve you turned on, is plugged up, and needs to be replaced or cleaned. Ok, now we're going to reconnect the water line. Alright, that's nice and snug. Now we can have our assistant turn the water back on, and we're going to turn the power back on, and test everything. Because we do have, at this point, good water pressure here. So now we're going to see what the problem is, if it's the solenoid valve or after the valve. Ok, we have a volt meter out, we're going to check for electricity here. So, one at a time, we're going to carefully remove the wiring nuts, get out our volt meter, attach these, one to each probe, alright. There we go. And we turn our volt meter on, 0.05. So, we do not have electricty here. What we're looking for is something in the neighboorhood of 24 or so volts, AC. We do not have it, so our problem is we have no electricity to our solenoid valves, so of course it will not open without power. So the problem here, is upstream. So we may have a problem with out humidistat, there may be a problem with a transformer, but at least we know it's not the saddle valve, because, the problem is, the real problem is we don't have electricity. Now we're going to turn on our volt meter, and what we're looking for is somewhere in the volts of 24 AC power. As you can see, we have about 26.85 or so volts, so at this point, we do have electricity to our solenoid valve, and the water is turned on. But you'll notice, we don't have any water trickling down the drain, i can't hear any water, and if we pop the top off of this, humidifier, we'll see that there's no water coming out of the solenoid valve. So we have electricity to it. Earlier, we verified we have water feeding it, we have electricity, water to it, nothing out. Alright, the water and electricity are turned off, we're going to go ahead and disconnect this. 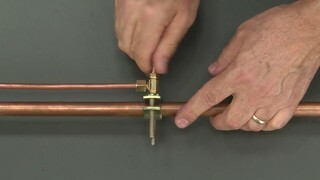 Alright, the feed tube is disconnected, now we're going to get a rag out, hold that up here just in case this valve actually opens. Alright, we're going to have our assistant turn the water and electricity back on. Alright, nothing. so, we have electricity turned on, the water is turned on, again, so we have pressure here, we have electricity here, we've tested that. There's nothing coming out of the valve; we have a bad solenoid valve. It is stuck closed. This is not an uncommon problem, so now all we have to do is replace the solenoid valve. Now if, when we turn the water back on and the electricity back on, we had water pressure here coming out at us, then the real problem would've been this orifice. Which gets plugged up perioidically. So, it's a normal maintenance item, just pop out the orifice, and slide a new one in.